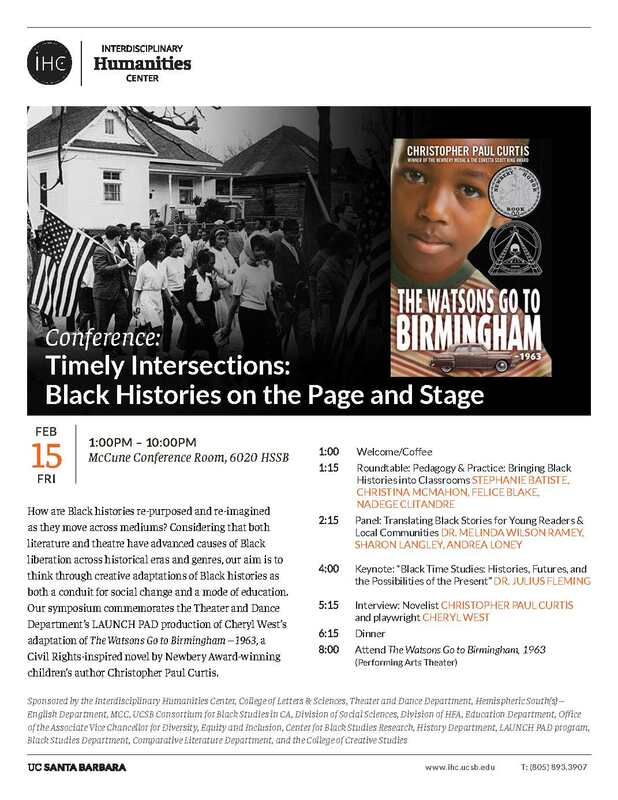 The conference "Timely Intersections: Black Histories on the Page and Stage" is on February 15th from 1PM-10PM in the McCune Conference Room- 6020 HSSB.How are Black histories re-purposed and re-imagined as they move across mediums? Considering that both literature and theatre have advanced causes of Black liberation across historical eras and genres, our aim is to think through creative adaptations of Black histories as both a conduit for social change and a mode of education. Our symposium commemorates the Theater and Dance Department’s LAUNCH PAD production of Cheryl West’s adaptation of The Watsons Go to Birmingham – 1963, a Civil Rights-inspired novel by Newbery Award-winning children’s author Christopher Paul Curtis.